A case about where a Justice Court judgment is recordable. It also makes a point about fees. 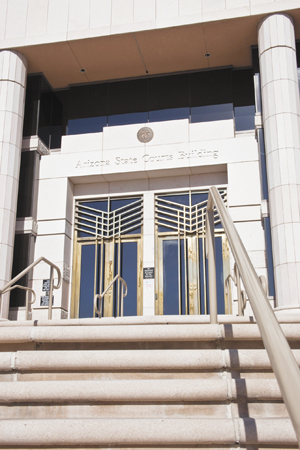 Plaintiff obtained judgment in the Pinal County Justice Court in 2011. It later recorded the judgment in Maricopa County. In 2016 it filed a renewal affidavit in Maricopa and began garnishment there. Defendant moved to quash the writ, arguing that the renewal was invalid because it should have been done in Pinal. The trial court denied the motion. The Court of Appeals affirms. Under 33-962 a Justice Court judgment may be recorded after filing a transcript with the Superior Court — which is what Plaintiff had done — and is thereafter deemed a Superior Court judgment. Defendant argued that the transcript must be filed in the Superior Court of the same county. But the statute doesn’t say so. That is a requirement for executing by levy on real property under 22-246 but the other collection statutes don’t contain the limitation. Regarding fees, Plaintiff argued that it was entitled to them in connection with its collection efforts because the judgment awarded “all reasonable costs and attorneys’ fees incurred” in collecting. The trial court awarded fees. But fees in garnishment are allowed only if the debtor objects “solely for purposes of delay or to harass,” 12-1598.07. Language in a judgment doesn’t override the statutes. Because the record doesn’t show how much of the fee award related to the garnishment and how much to allowable non-garnishment work (e.g., renewing the judgment) the court remands the issue. Someone seems to have worked hard on this opinion but it could have used one more major edit. The extensive discussion and analysis of J.C. Penney, for example, is interesting but its effect on this holding is not always clear.